Paul Ferris, CEO of the Catholic Education Convention makes the prize draw on the CrestClean stand. Looking on is Sam Creasy, CrestClean’s National Accounts Manager. Changing the cleaners literally proved to be a breath of fresh air for a school suffering from a little wee problem. 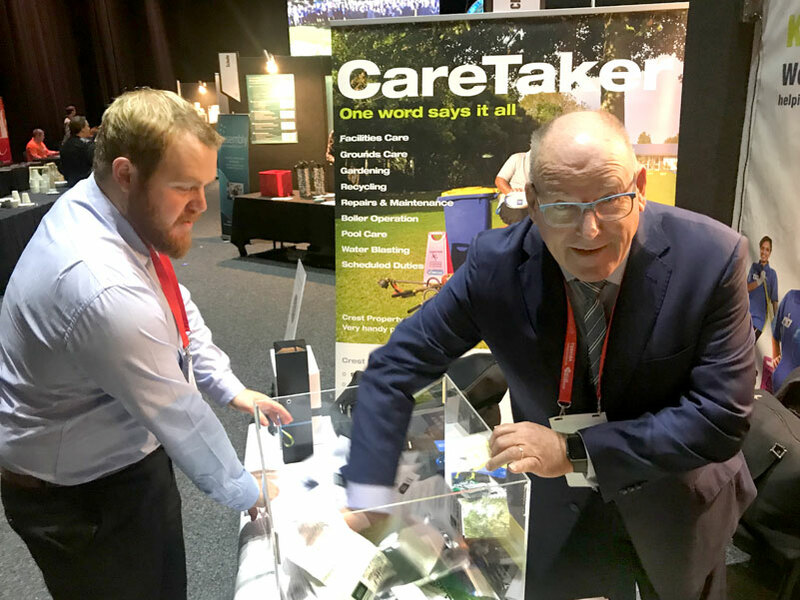 The sorry saga of the classroom that was adjacent to the boys’ toilets was just one of the anecdotal stories told to CrestClean managers who attended a recent education conference in Wellington. Sam Creasy, Crest’s National Accounts Manager, takes up the story relayed to him by a teacher at the New Zealand Catholic Education Convention. “She said her classroom was the one that no one wanted to be in because it had a toilet block attached to it. Sam says he was delighted for the teacher to hear there had been a happy ending to her tale of woe. “She told me that things dramatically changed after the school switched their cleaning arrangements to Crest. About 800 delegates attended the three-day event, held at Wellington’s TSB Arena. 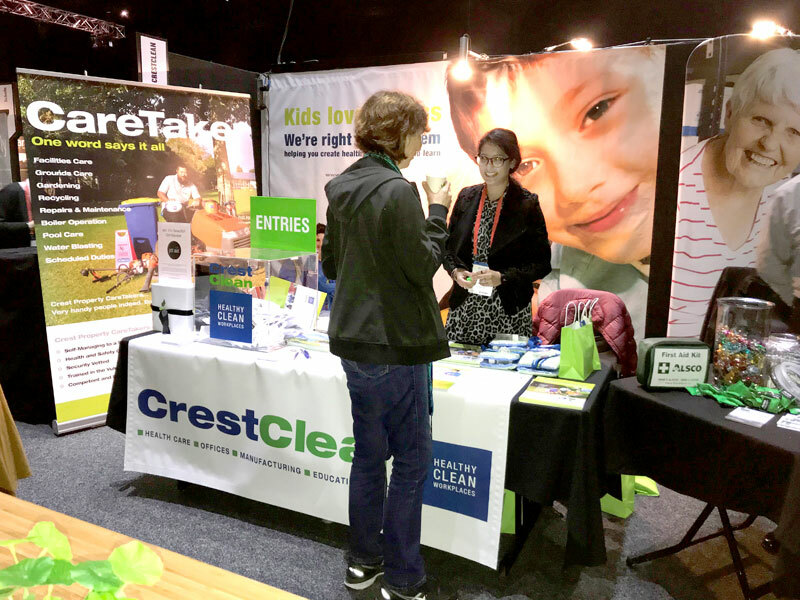 As well seeking information about cleaning, a number of principals made a beeline to the Crest stand to enquire about the other services that CrestClean offers to schools. Caretaking was a hot topic of conversation. “Some schools that had a caretaker on the staff who was near retirement age were interested in exploring their options,” says Sam. Crest Property Care provides schools with a viable alternative to directly employing a caretaker. 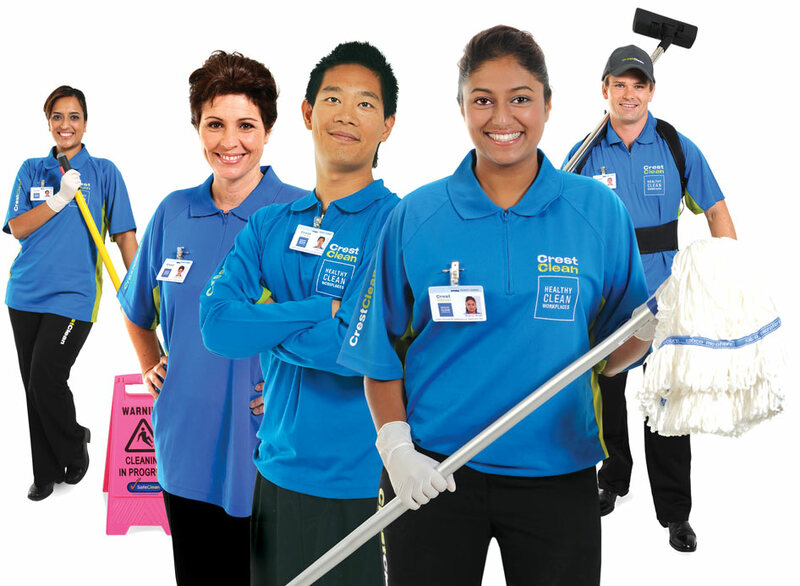 Crest caretakers have a trade background and caretaking duties can be packaged together to operate on a contract basis, with a similar budget as having a direct employee. Also attending the conference was Shareen Raj, Crest’s Palmerston North / Kapiti Coast Regional Manager. She says there were many positive comments from principals who were Crest customers. A conference prize draw run by CrestClean attracted more than 200 entries. The gift hamper, supplied by GiftSaint, was won by Janet Cummings from Our Lady of the Assumption School, Christchurch. Shareen Raj, Palmerston North / Kapiti Coast Regional Manager, answering questions at the conference.